Good news that 6 more clean water wells have been dug. This makes a total of 28 wells dug by MFM. All of the Medicine for Mali programs-Clean water, Micro-finance loans, Teacher training, are operating this year in Mali. In addition Public Health programs of Matrone training , malaria prevention, and immunizations are on-going this year. Our village volunteers have been trained and work hard on these things every month in their own villages. Dave and Drake U pharmacist John Rovers went to Mali in Feb, 2014. They got 4 new clean water wells installed in even more remote villages. Our villagers told them how much they appreciated the midwife coming to train their village matrones. MFM hired a Malian doctor to hold a medical clinic in the Health Center. He was pleasantly surprised by the lack of diarrhea in our area. He had expected to see a lot of this. But, thanks to the clean water in these villages , he did not have patients will this ailment. The rebellion in the north of Mali has not had a direct effect on our villages as they are far away from this trouble. We are thankful for that. Ebola has not been found in Mali, as of this writing. Young mothers and children waiting to get immunizations. Drake University students in Iowa are raising money for a solar refrigerator for to keep vaccines at correct temperature. So far they have raised $1700, about 1/2 of their goal. Great Job!!! 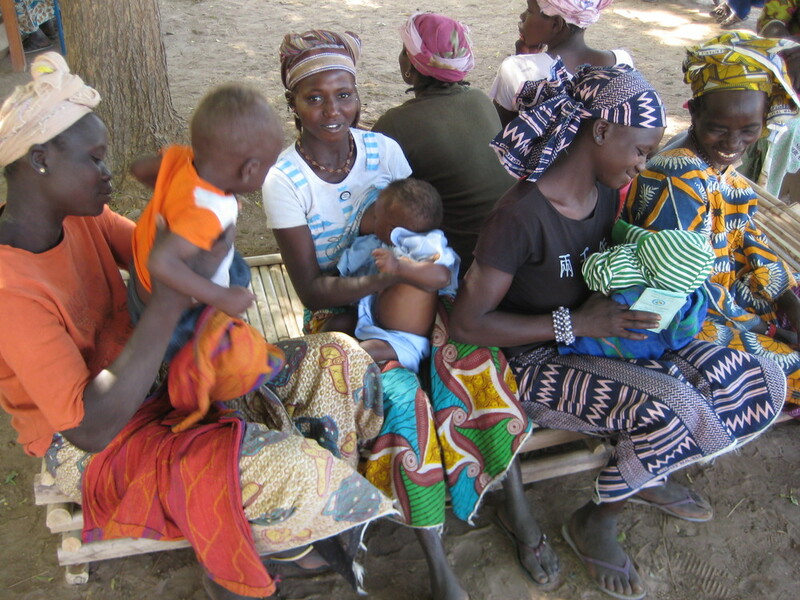 Photo of young mothers and their children waiting for immunizations in one of our villages. Be sure to read this good article by Tony Leys. It discusses Medicine for Mali's work and the fact that the Medical Team is not going to Mali in 2013 but our work continues. Check out this link. Aid for AfricaAid for Africa posted a nice article about Medicine for Mali and the fact that our work continues in Mali in 2013 even though a trip by American volunteers is not possible this year. Bexley Methodist Church of Columbus, Ohio has donated a scholarship for a girl to go to high school in the capital of Bamako.These scholarships are awarded to the top girl and boy in their class in 4 schools. We all had a fun time in Columbus, OH as friends, neighbors, and family gathered to listed to Jill discuss this years public health and education efforts in Mali. Thanks mom! And, thanks to everyone who attended!